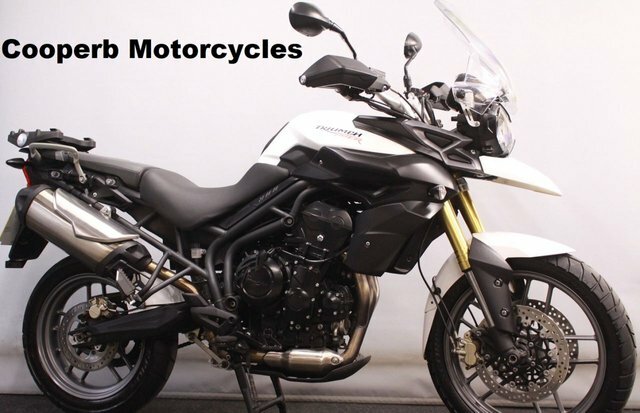 FREE 3 Years Legal Expense Cover, Part Exchange VERY Welcome, HPI Clear, All Bikes Come With Full Warranty & PDI, Carefully Prepared By Time Served Professionals, The Tiger 800 Has Taken Riders On Adventures On Every Continent And Created Thousands Of Memories Across The Globe! This Bike Has Real Pedigee & If Your Looking For A Great Adventure Bike Should Not Be Overlooked! Stunning Bike! This Bike Has Been Fitted With A Hugger, Fender Extender & Hand Guards + More!! Nationwide Delivery From £120 + VAT. Buy 24/7 by TEXT On 07970 777639 - Low Rate Finance From ZERO Deposit, 60 Day Payment Holiday With All Standard HP Deals On Moto Novo. Typical Finance Example, £699 DEPOSIT Then 36 X £112.63 Total Payable £6,235.04 Inc.Deposit, Flat Rate 5.5 % APR 12.8 % Representative. Finance Is For Over 18'S Only, Available STS, Terms Conditions Apply At Cooperb Motorcycles we like to offer the friendly personal service that only a family run dealership can offer. We listen well, try our hardest to help ONLY offer the highest quality bikes we can find!